Al Contarino built his first grill top pizza oven in 2010 to solve the consistent-high-temperature problem that often thwarted his grill-powered pizza-making efforts. 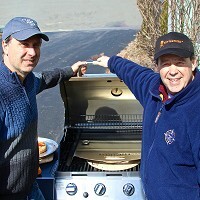 Along with fellow inventor George Peters, they tested their grill pizza insert out on friends who raved so much that the duo knew they were on to something. KettlePizza is the result of Al and George’s hard work, and their determination to design and manufacture it on their own and in the USA. The oven inserts fit on top of the grill grates in gas and charcoal grills. 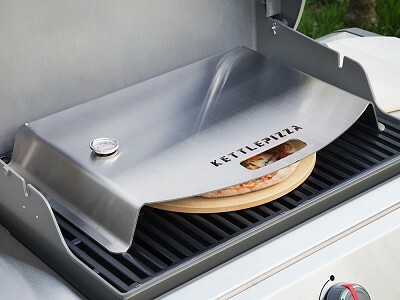 The gas grill insert is designed to help heat circulate and radiate down from the lid to cook the pizza evenly and completely. 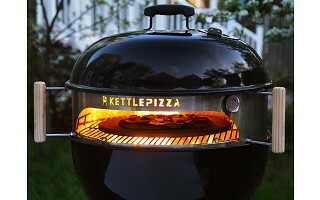 The charcoal grill insert does the same job in just about any kettle-style grill. Charcoal briquets along with hardwood help get that perfect wood-fired crispiness (and taste). 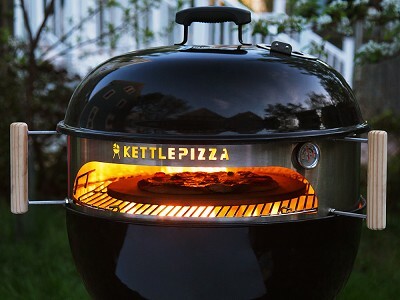 Whatever type of grill you have, KettlePizza makes it easy to add pizza to your cookout menu—and feed the crowd in under 10 minutes. What kind of grill do I need to use the oven kits? For the charcoal kit, you need an 18.5” or 22.5” kettle grill. The gas grill kit requires a grill with at least three burners and a minimum 24” x 17” grill area. The size of the opening of the charcoal oven kit is 17” x 3.5”. The charcoal kits will fit the Weber kettle grill called "Weber 22". How hot do the ovens get? The charcoal kits can easily get over 700 degrees F. The gas grill kits can get to 600-700 degrees F depending on the BTUs of your grill. Can I use my own pizza stone? No, it is recommended that you use the KettlePizza cordierite pizza stone, as it was designed to withstand temperature up to 1000 degrees F and will not suffer from thermal shock like many oven-style pizza stones. The baking steel included in the charcoal kits can be used as well. Can I cook other foods besides pizza? You can bake and grill all kinds of foods, including bread and cookies. 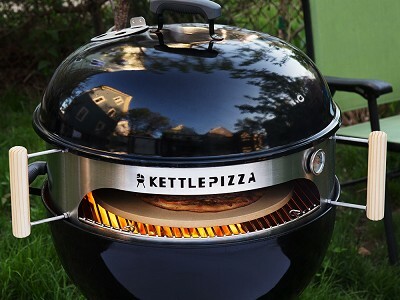 You can also cook multiple pizzas without needing to refuel the charcoal grill. Five to six pieces of hardwood will get the grill hot enough to cook four to five pizzas. How do I refuel the charcoal oven kits? You must remove the insert from the grill to add fuel to the grill base.